I was recently challenged to recreate one of Chef Antonia Lofaso’s amazing desserts using our favorite Breyers Natural Vanilla Ice Cream. I have to be honest…the dessert option I chose seemed a little fancy to me, and I was a bit intimidated. Boy, was I wrong!!! 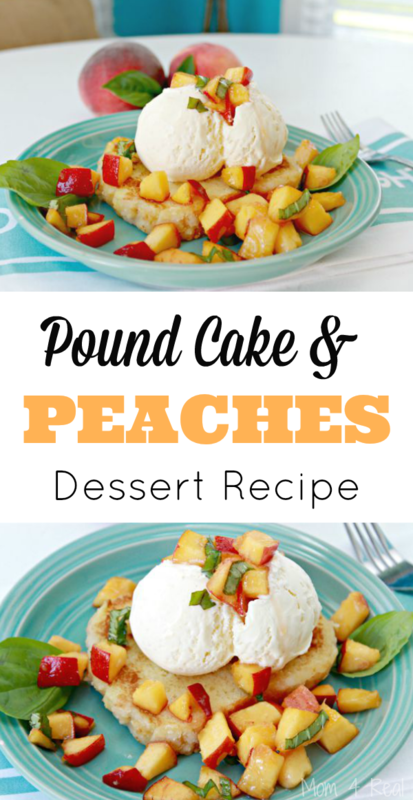 In just a few minutes, I had whipped up this truly amazing Pound Cake and Peach Sundae! And folks, it is truly delish! 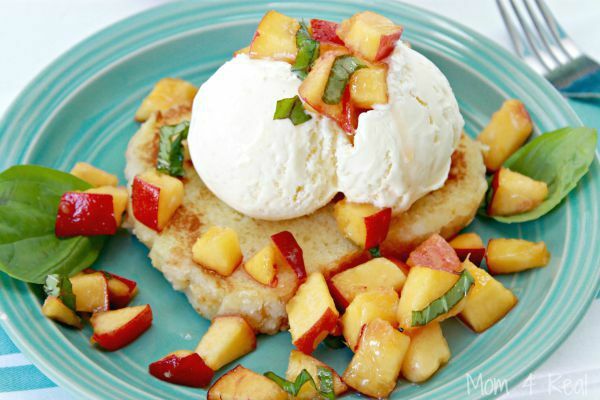 Here is the original recipe…Chef Antonia Lofaso’s Pound Cake & Peaches Sundae! 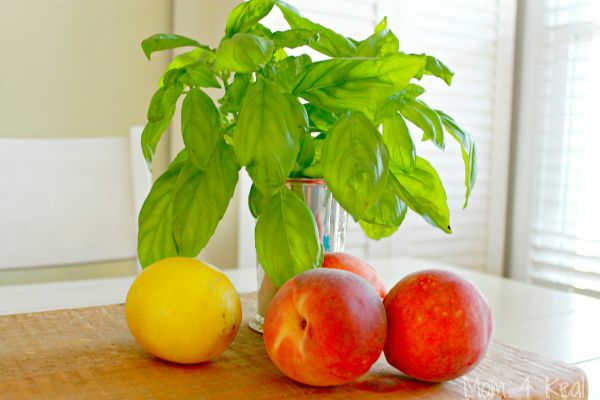 I started by preparing the macerated peaches with basil…what a combination! Doesn’t that look amazing? I also toasted some store bought pound cake. 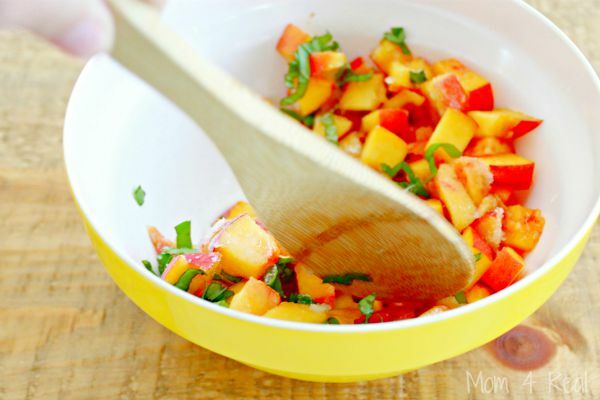 There is no shame is using store bought ingredients to create an amazing dessert. I grabbed some Breyers Natural Vanilla Ice Cream at the grocery store. We love Breyers because they are committed to using high quality ingredients. 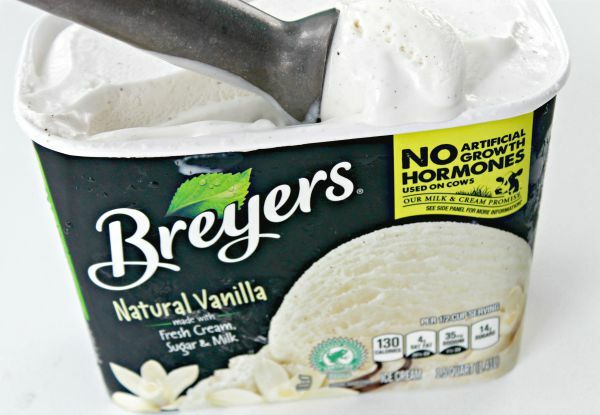 Breyers Natural Vanilla is made with fresh cream, sugar and milk, and sustainably farmed vanilla beans, and they are America’s No. 1 vanilla ice cream! Parents now have additional reasons to feel good about serving it to their family. They also source their milk and cream from cows not treated with artificial growth hormones*. All Breyers vanilla is real and from sustainably farmed, Rainforest Alliance Certified vanilla beans. These Breyers products are available in grocery stores nationwide for a suggested retail price of $3.99 – $5.99! To put the dessert together, I simply placed a piece of toasted pound cake on each plate, topped with a scoop of Breyers Natural Vanilla Ice Cream on top, then finished off with a generous helping of macerated peaches and basil. I have to tell you, my entire family fell in love with this dessert, and I cannot wait to share it with some of my friends!